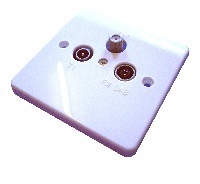 The Multi Service Wall Plate (MSWP) is designed to be used in conjunction with our 4 or 8 way Loftbox. The wall plate is designed to split the signals coming down from the Loftbox and also to provide the return path back to the Loftbox. 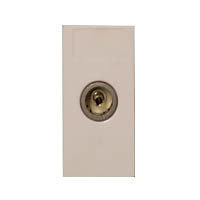 Also incorporated is one slave telephone socket should you wish to connect a digibox or telephone to your existing phone system. There is also space to allow a further 'Euro Module' to be inserted such as a RJ45 connector. A UHF module which can be used to expand the multi service wall plate when two satellite feeds are required AND a UHF return for SKY. 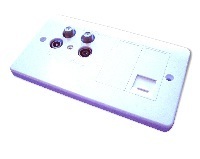 The Quad wall plate is designed to be used in conjunction with our 4 or 8 way Loftbox. Housed in a single gang box, it splits the signals coming down from the Loftbox and also provides the return path, required for the tvLINK, back to the Loftbox. 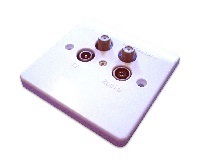 The Triplex wall plate is designed to split out the signals from one co-axial cable into their respective frequencies i.e. Satellite, TV and FM.